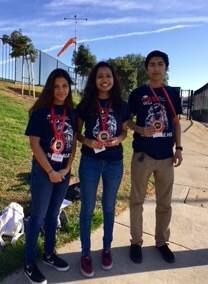 & Moises Contreras for winning 2nd place out of 26 schools in the 2016 Raytheon E Games Engineering Day. This year was a Star Wars theme where the the protagonists had to build a "weapon" against the enemies, students built a trebuchet. The students, together with Engineers and Advisors, designed, constructed and tested the trebuchet machine with a goal of shooting a given object / projectile the farthest distance. The final score was an average of those two shots. Lawndale HS with North Torrance HS won 2nd place.